The trio of Deepak Dahiya, Vikas Kandola and Wazir Singh combined to score 23 raid points to lead their team to victory. Haryana Steelers posted a convincing 41-30 win over U Mumba in Vivo Pro Kabaddi League season 5 at the Nehru Indoor stadium on Wednesday. The trio of Deepak Dahiya, Vikas Kandola and Wazir Singh combined to score 23 raid points to lead their team to victory. Anup Kumar scored 10 points for U Mumba but Kashiling Adake had a disappointing match and that affected U Mumba's performance. U Mumba's defence let them down as they contributed just three points and couldn't deal with Haryana Steelers' raiders. Haryana Steelers are now second in Zone A with 64 points after 19 matches. U Mumba are fourth with 54 points from 19 matches. Steelers made a quick start as they led 3-0 after two minutes. Shrikant Jadhav scored two points in two raids to draw U Mumba level at 3-3 in the fourth minute. 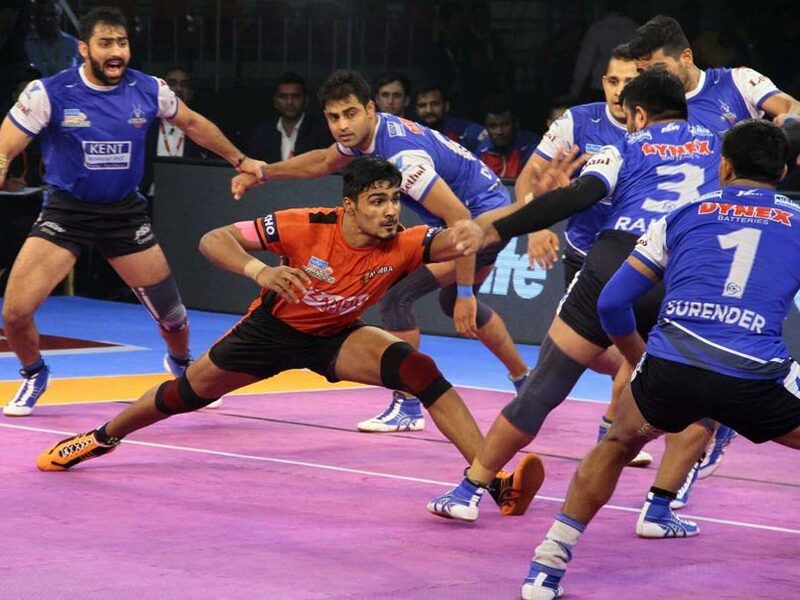 Kashiling Adake scored his first raid point in the sixth minute as U Mumba trailed 4-5. Anup Kumar got into the act as he got a super raid to give U Mumba 10-8 lead in the 12th minute. The Haryana Steelers came back strongly and scored four straight points to lead 14-10 after 15 minutes. 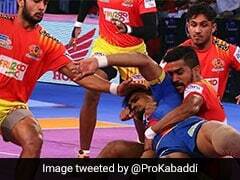 Kuldeep Singh made a super raid in the 16th minute as U Mumba trailed 13-15. Haryana Steelers inflicted the first all out of the match in the next minute to lead 19-14. U Mumba were looking under pressure as Vikas Kandola scored eight points in the first half for Haryana to give them 22-16 lead at the break. Anup Kumar scored with a two-point raid in the 22nd minute as U Mumba trailed 19-24. Haryana Steelers kept picking points with ease and didn't let their lead slip anytime for the first 10 minutes of the second half. Deepak Kumar Dahiya made a successful raid in the 26th minute as Steelers led 27-20. Haryana Steelers held a six-point advantage with 10 minutes left on the clock. Wazir Singh scored with a two-point raid in the 32nd minute to give Haryana Steelers a 32-24 lead. With another all-out inflicted by Haryana Steelers in the 35th minute, the match was all but over as a contest. U Mumba trailed 27-38 and with Kashiling Adake misfiring, the outcome was never in doubt.